This was first featured on Space Wolves Blog written by Bill Lewis in 2011, unfortunately that blog is now lost to the warp. In an effort to retain the information we have republished it here. The mighty Land Raider is not just a mere tank, but a mobile bunker reinforced with the heaviest of ceramite armour and bristling with an array weapons. They are the heaviest vehicle fielded by the Space Wolves and are used as command centers, tank hunters, firebases, and assault vehicles. These venerable behemoths are the core of a mechanized Space Wolf assault, rumbling steadily across the battlefield and leaving only destruction and the corpses of the foe in their wake. The first strength of the Land Raider is their Armour Value of 14. This thick armour makes them nigh-impregnable to all but the heaviest of anti-tank weapons. By having this value to all sides, they are equally protected from enemy attacking from the flanks, rear or in close combat. These tanks truly are among the mightiest on the table and most attacks will rattle harmlessly off their slab armoured sides. The second strength of the Land Raider is the Power of the Machine Spirit. Equipped with powerful cognitive engines, every Land Raider is possessed of an internal consciousness that is honoured as a full Space Wolf. This ghost in the machine assists with the weaponry of the vehicle such that they target with unmatched skill and accuracy. They allow the tank to always fire one more weapon than normal, even times when it would otherwise not be able to fire at all! Additionally, this weapon may be fired at a different target than the rest, greatly increasing the flexibility of Land Raider shooting. Coupled with an impressive array of armaments makes every one of these tanks a mobile firebase in their own right. The third strength of the Land Raider is the Assault Ramp. These jawlike ramps protect the front of the tank, ramming into enemy positions and opening to disgorge the warriors inside. This special equipment allows any infantry transported to assault even if the tank has moved already. Disembarking adds a 2” base displacement away from the ramp, giving the transported unit one of the longest assault ranges in the game. This makes the vehicle perfect for the lightning assaults favoured by the Space Wolves; the pack swiftly closing for the kill before the enemy has any chance to react. 1. “Godhammer”: The basic variant, the Godhammer packs a Twin-Linked Lascannon in each side sponson and a Twin-Linked Heavy Bolter in the front pintle. It is also capable of Transporting 10 normal Infantry or 5 Terminators. Sadly, this iconic tank suffers from a bit of identity crisis. As an assault transport, it is designed to smash into the enemy at close quarters. Yet its weaponry is designed for long-range engagements and has to remain stationary to fire all weapons. Thus the most optimal role is as an anti-tank firebase with a counter-assault unit inside. As a defensive stance rarely wins games, most players will either accept some reduction of effect or field a different variant. 2. 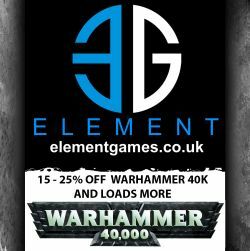 “Redeemer”: The newest variant to take the fields of the 41st millennium, the Redeemer puts a fearsome Flamestorm Cannon in each sponson and an Assault Cannon in the front pintle. The redesigned troop compartment also allows two more Marines or another Terminator, making this an excellent choice of transport for a 10-Marine Grey Hunter unit, a Wolf Guard Pack Leader, and an Independent Character. With a maximum weapon range of 24”, sponson ranges of only a Flamer template, a decent Transport capacity, and Frag Assault Launchers, the Redeemer variant truly is a mighty assault vehicle. Much like the Godhammer though, this variant has difficulty getting full effect from the weapons mounted on it. The short range and hull separation of the Flamestorms make it nearly impossible to maximize the coverage of both templates, especially as few opponents are polite enough to bunch their units up when they see a Redeemer coming. Additionally, the tank cannot fire more than two systems while on the move. Thus a Redeemer typically closes with the enemy at top speed while using the Machine Spirit to fire the Assault Cannon or optional Multi-Melta. It is only at short range that the vehicle will slow down, pivot to favor one sponson or the other (typically the right to maximize fire arc from the front pintle), and then open up with a Flamestorm. This type of attack can be devastatingly effective and leave the assault unit inside with little to do but clean-up the mess. 3. “Crusader”: Arguably the most common variant seen on the tabletop, the Crusader mounts a set of devastating Hurricane Bolters in each sponson and an Assault Cannon in the front pintle. It also boasts an even larger internal capacity and is capable of Transporting 16 Marines or 8 Terminators. This variant really is the luxury model of Land Raider. Not only does it boast room enough for your Wolf Guard and all their lupine friends, the sponson weaponry is classified as “defensive” and can be fired to full effect on the move. This allows the tank to close on the enemy while putting out fire similar to a Tactical Squad. Even if you add on the optional Multi-Melta for anti-tank, the Machine Spirit keeps you able to fire every weapon and move 6”. 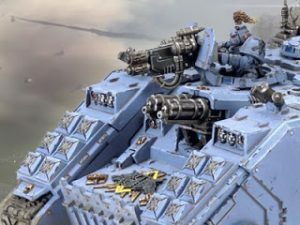 When you add the effect of Frag Assault Launchers to all these other benefits and the normal Land Raider package, it is easy to see why the Crusader is the favorite choice of most Wolf Lords. For all the perks and benefits spoken of above, the Land Raider has one simple problem and that’s price. You have to pay for every single one of those bells and whistles, even if you never use them. For the cost of a single Land Raider, you could run two or more of any other basic tank. A Land Raider will also often have a full unit and attached character embarked in it. This can quickly push the sum value of the model to 600 points or more and eat up a sizeable chunk of your points. This kind of investment is too sizeable to just “tack on”. It is a core choice around which the rest of your list will be based. There’s a certain risk to this too… one lucky shot will see a lot of that going up in smoke. Land Raiders are tough, but don’t expect them to save you from bad tactics. Trust in your armour and the Emperor, but also trust in your cover and Smoke Launchers. An army fully mounted in multiple Land Raiders offers you certain unique pros and cons. While you will have less units to attack the enemy with, you’ll also cede less Kill Points in total. While you might have issues against an opponent with lots of anti-tank, you’ll be able to ignore any weapon with a strength less than 8. This is certainly the extreme style of Land Raider use, but it can be extremely daunting to face. Overall the Land Raider still offers a protection package unparalleled by any lesser vehicle. If you absolutely, positively want to move a big unit across the field and into assault, there’s nothing better. 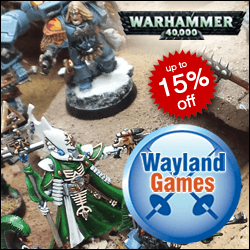 Though it is not a cheap vehicle to field, every Wolf Lord should consider having a few available for their Great Company.